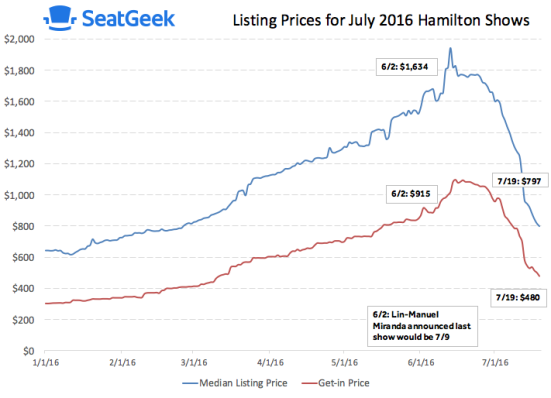 Since Lin Manuel Miranda departed Hamilton on July 9, tickets for the historic musical have dropped significantly. Currently, tickets are available for under $500–the lowest they have been in months. Prior to Miranda’s June 2 announcement that his last show would be July 9, tickets to July 2016 Hamilton performances from now until the end of this month averaged a median listing price of over $1,600 and a “get-in” price (cheapest ticket) of nearly $1,000. Today, fans can get into those same shows for as low as $350, a relative bargain. In addition, when looking at average resale prices (purchase data), fans paid over $1,300 on average for resale tickets to shows between June 3 and July 9, Miranda’s final stretch of performances. Since that last show, the average resale price has fallen to about $750. Interested in attending Hamilton? Head here to browse for tickets. | Need to sell your Hamilton tickets? Head here to list them on SeatGeek.